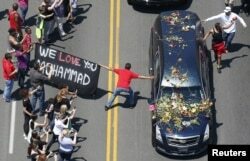 Kids throwing feints with boxing gloves, kids displaying elaborately drawn pictures and kids chanting "Ali, Ali, Ali" greeted the champ's 17-car motorcade Friday afternoon as it rolled through the neighborhood where boxing great Muhammad Ali grew up in Louisville, Kentucky. The West End was hopping. Children ran alongside the long, black cars as they passed one by one, making no distinction between the one that carried Ali's cherry-red casket, draped in an Islamic shroud, and the ones that carried his friends and family. The procession was on a 19-mile drive past the places that were important to Ali: his boyhood home and the gym where he first learned to box. "I love how he set up all this himself before his passing. To include everybody, that's what's so important. He wanted to include us and that's what's important, I think, to the city of Louisville, to be a part of this," said bystander Glenda Victor. What Ali planned before his passing has had a magical effect on his old neighborhood in the week since his death, according to Virginia Barger. A well-wisher holding a banner touches hearse carrying remains of Muhammad Ali during funeral procession for the three-time heavyweight boxing champion in Louisville, Kentucky, June 10, 2016. "There's been no violence, there's been no [bloodshed]. It's just awesome,” she said. “His legacy is just of peace. It'll live forever. It's truly unbelievable that one man could impact a whole world like this." Barger said she was sitting at home when she saw the motorcade leaving the funeral home. "And I just had to be a part of it. It's history." For the elders in the crowd that lined the streets, it was not only a time to celebrate the great man who died last Friday at the age of 74, but time for personal reflections on what seemed like the passing of a generation. Teacher and Episcopal priest Dan Dykstra saw Ali as a man on a journey. "He started off more conservative and orthodox than he ultimately became as a man that wanted to include everyone, so I do see him as a unifier and as an example for us to emulate." Dykstra compared Ali's journey to his own. 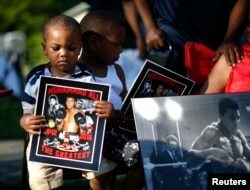 Brandon Liggons, 2, (L) holds an image of Muhammad Ali during the funeral procession for the three-time heavyweight boxing champion in Louisville, Kentucky, June 10, 2016. "My own father when I grew up was critical, but with time and watching his life and his person I've come to see him as a far more unifier than a separator and for me, that's what I'm all about," he said. Ali, Dykstra said, made it possible "to allow ourselves to change." While Dystra was looking back, Victor had a vision of the future. "I hope this will open up our youth's eyes here in the city of Louisville to stop some of the violence and maybe go into boxing and have more boxing greats come from Louisville. Really following his footsteps, that's what it means to me. To see the violence toned down and see our youth just following in his footsteps." As the procession wound its way out of the West End, people said their final farewells to Ali. Amid the continuous chants, mourners pumped fists, displayed signs, and tossed flowers on the hearse, almost completely covering its windshield. The procession carrying Ali's body ended at Cave Hill Cemetery, which he chose as his final resting place a decade ago and which is on the National Register of Historic Places.